At the invitation of Prime Minister Lee Hsien Loong of the Republic of Singapore, Premier Li Keqiang will pay an official visit to Singapore and attend the 21st China-ASEAN (10+1) Summit, the 21st ASEAN Plus Three Summit and the 13th East Asia Summit from November 12 to 16. As agreed by the two sides, the second round of China-US Diplomatic and Security Dialogue will be held in Washington D.C. on November 9. Member of the CPC Central Committee Political Bureau and Director of the Office of the Foreign Affairs Commission of the CPC Central Committee Yang Jiechi will co-chair the dialogue with US Secretary of State Mike Pompeo and Secretary of Defense James Mattis. State Councilor and Defense Minister Wei Fenghe will attend the event. The two sides will have an in-depth exchange of views on China-US relations and other issues of mutual interest. Q: Could you give us more details on Premier Li Keqiang's upcoming visit to Singapore and elaborate on the current China-Singapore relations? How does China look at the current East Asia cooperation? What message does China want to convey through the series of leaders'meetings on East Asia cooperation? A: During his visit to Singapore, Premier Li Keqiang will hold talks with Singaporean Prime Minister Lee Hsien Loong, attend the welcoming banquet held by Prime Minister Lee Hsien Loong and meet with Singaporean President Halimah Yacob. Premier Li Keqiang will deliver speeches and attend and address the welcoming banquet held by the business community in Singapore. Singapore is a friendly neighbor of China. The two countries have established the all-round cooperative partnership progressing with the times and conducted fruitful cooperation under the framework of the Belt and Road Initiative. Premier Li Keqiang's upcoming official visit to Singapore is the first one by a Chinese Premier in eleven years. It aims to further enhance China-Singapore traditional friendship, deepen mutually beneficial cooperation and move forward the bilateral ties in the new era. The leaders from the two sides will take stock of the successful experience in the development of our bilateral ties and map out cooperation across the board in the future with priorities placed on the Belt and Road Initiative and innovation. The two sides will exchange views on regional cooperation and major issues of mutual interest in the context of the current regional and international landscapes. This year marks the 15th anniversary of the establishment of China-ASEAN strategic partnership as well as the China-ASEAN Year of Innovation. The China-Japan-ROK cooperation is regaining momentum. The negotiations on the Regional Comprehensive Economic Partnership are moving forward at a faster pace and the regional countries have a strong aspiration for advancing regional economic integration. 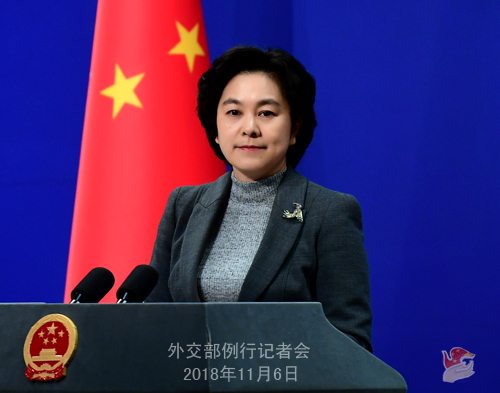 The situation in the South China Sea has stabilized and improved, and positive progress has been achieved on the Code of Conduct in the South China Sea (COC) consultations. The East Asia cooperation is presented with new opportunities. Premier Li Keqiang's attendance at this year's meetings on East Asia cooperation is of great significance to elevating and upgrading China-ASEAN relations and promoting the in-depth development of East Asia regional cooperation. Now the international and regional situations are undergoing complex and profound changes. As developing countries, China and ASEAN countries share extensive common interests and have a very strong aspiration for stronger cooperation. We hope to take the 15th anniversary of the establishment of China-ASEAN strategic partnership as an opportunity to further enhance political mutual trust, deepen practical cooperation in economy and trade, innovation, cultural and people-to-people exchanges and military and elevate bilateral ties to a higher level. We hope that the series of meetings will focus on East Asia, promote development and cooperation, advance regional economic integration, uphold multilateralism, free trade and international rules and contribute to regional peace, development and prosperity. Q: It is reported that Vice Chairman Kim Yong Chol of the Central Committee of the Workers' Party of Korea will travel to New York for the DPRK-US high-level talks. Has he arrived in Beijing? Does the Chinese side plan to hold talks with him? What are your expectations for the DPRK-US high-level talks? A: I have no information to announce in this regard. China always supports the DPRK-US dialogue. We hope that the DPRK and the US, through dialogues at all levels, including the leaders' summit, can enhance mutual trust, implement the consensus that has been reached, address each other's legitimate concerns and advance the denuclearization of the Korean Peninsula and the political settlement process of the Korean Peninsula issue. Q: First, according to our information, the US issued waivers to "allow" China to import oil from Iran at the last minute. Can you tell us the reason behind this and offer us more details in this regard? Second, this morning, the Australian Foreign Minister, before leaving for China, said that she hopes that the China-Australia relations could be "reset". What is your response to this? A: Regarding your first question, I already elaborated on China's position on the new round of sanctions imposed by the US on Iran yesterday. I would like to stress again that the cooperation between China and Iran is open, transparent, legitimate and legal, which should be respected. 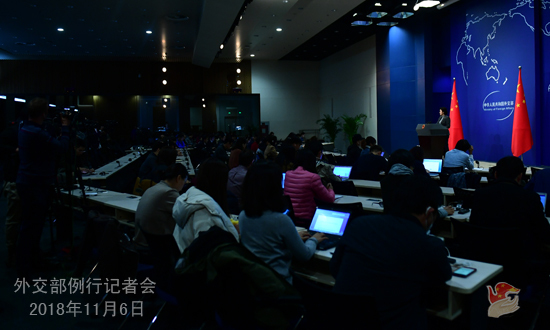 The Chinese government is committed to upholding the legal rights and interests of the Chinese enterprises. We are willing to play a positive and constructive role in promoting the stability of the international energy market. As to the Australian Foreign Minister's upcoming visit to China, we have made clear China's principled position on developing China-Australia ties on many occasions. In September this year, State Councilor and Foreign Minister Wang Yi met with Foreign Minister Marise Payne at request on the sidelines of the UN General Assembly, during which the two sides had an in-depth exchange of views on China-Australia relations and issues of mutual interest and reached important consensus. 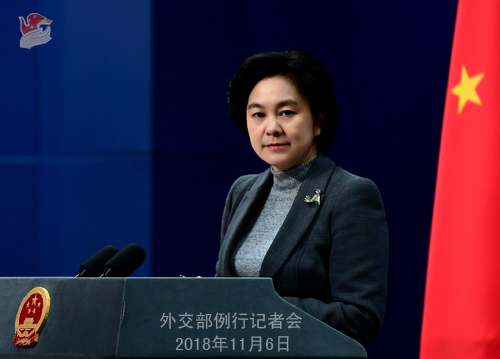 During Foreign Minister Payne's visit to China, State Councilor and Foreign Minister Wang Yi will hold a new round of China-Australia diplomatic and strategic dialogue with her. We stand ready to work with the Australian side to expand exchanges and cooperation across the board and move forward the comprehensive strategic partnership on the basis of mutual respect, equality and mutual benefit. Q: You just announced that Member of the CPC Central Committee Political Bureau and Director of the Office of the Foreign Affairs Commission of the CPC Central Committee Yang Jiechi and State Councilor and Defense Minister Wei Fenghe are going to Washington to co-chair and take part in the second China-US Diplomatic and Security Dialogue. Also in Singapore, Vice President Wang Qishan said that China was going to talk with Washington to resolve the trade dispute. Does that mean ties between China and the US are improving? Can this translate into resolving or alleviating trade tensions with the US? A: Recently, President Xi Jinping had a telephone call with US President Trump at request. The two heads of state both said that it is very important for China-US relations to maintain healthy and stable development. The economic teams of both sides should strengthen contacts, maintain communication, and conduct consultations on issues of mutual concern in a bid to reach an arrangement on the trade issue that is acceptable to both sides. Regarding the issue of China-US economic and trade frictions, we have repeatedly stated China's position. We believe that properly resolving the relevant differences through consultations on the basis of equality, good faith and mutual respect surely will serve the best of our shared interests and meet the aspiration of the international community. We hope that the economic teams on both sides will faithfully implement the consensus reached by the two heads of state, strengthen contacts and maintain communication, and hold consultations on issues of mutual concern with a view to reaching a mutually acceptable plan. Q: According to reports, there is a report by the US think tank the Jamestown Foundation saying that Xinjiang's spending on security-related areas tripled for the year 2017, which seems to contradict China's statements that it is aimed to provide vocational training for people in Xinjiang. What is your response? A: Regarding the vocational education and training in Xinjiang, as we said many times, the chairman of the Xinjiang Autonomous Region has briefed on the relevant situation in an interview. I would like to advise you to have a thorough reading of that. As you mentioned, the US think tank seems very interested in the figures of the inputs in the security area in Xinjiang. I don't know where they got these figures. I wonder whether this think tank also knows about how much the local government has invested in developing economy and improving people's livelihood, and how much the people have benefited from that. What I want to tell you is that since the 1990s, Xinjiang has long been plagued by ethnic separatism, religious extremism, and violent terrorism from at home and abroad. These three evil forces have plotted, organized and conducted thousands of violent terrorist attacks including bombings, assassinations, poisoning, arson, assaults, unrests and riots, causing the deaths of a large number of innocent people and police officers, as well as immeasurable property damage. In recent years, Xinjiang has worked for the general goal of ensuring social stability and long-term security and increased inputs and made major achievements in fighting against terrorism and safeguarding stability. Just as the chairman of the Xinjiang Autonomous Region said, in the past 21 months, no violent terrorist attacks have occurred, including those endangering public security. Public security has notably improved, and people are now feeling more secure. I'm not clear about the specific figures of Xinjiang's inputs in the security area, but I do know that life is precious and invaluable. It is most essential that people of all ethnic groups in Xinjiang are now feeling more secure and their life and property are safeguarded. Q: Will President Xi Jinping be attending the APEC summit in Papua New Guinea? Will he be separately meeting with the leaders of Pacific island countries? A: Papua New Guinea will soon host the APEC Leaders' Meeting, and President Xi Jinping will attend it. The schedule of activities during the meeting is still under communication and being arranged, and we will release relevant information in due course.